Taste test: This a pretty good chip/dip combo. 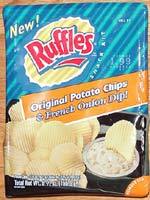 Ruffles has recently widened the ridges of their chips, and the wide ridges do a good job of picking up the French Onion flavor. The dip was OK. The number of chips in the bag seemed kind of skimpy, particularly relative to the amount of dip in the container. 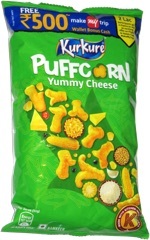 Smell test: The chips smell like regular Ruffles. The French onion dip has the regular French onion dip smell, but it's quite pungent, as you can smell it from several feet away.